Today, I was digging in GitHub search results, and I noticed that aedit and zedit showed up side-by-side, what a coincident and a great chance to make a list of A-to-Z editors in regular expression of /[a-z]edit/. This is a note page for Git usage that I most likely cant remember how to issue the commands for the tasks. Using filter-branch, see Extracting directory or files with commits history from Git repository. In January, 2013, I started to record the lines of my ToDo files which are taken in vim-notes. 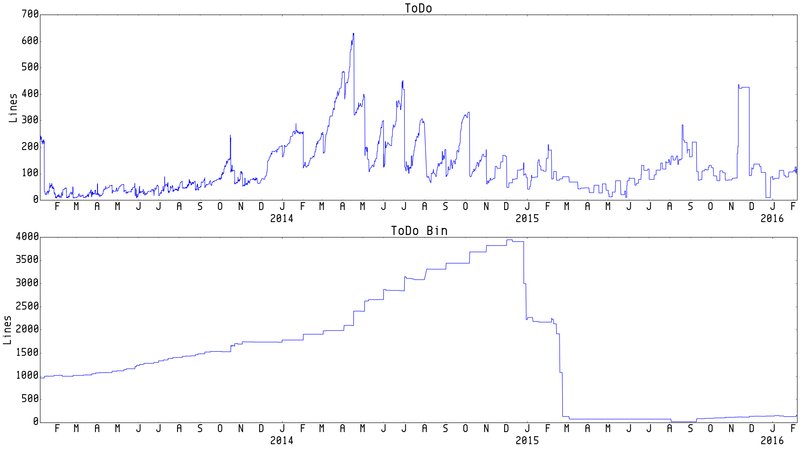 One year later, I used Python and matplotlib to draw a graph. For both in the first year, there were much more changes than the last two. The reason for that is I constantly :w the notes when every I made a changes to them. 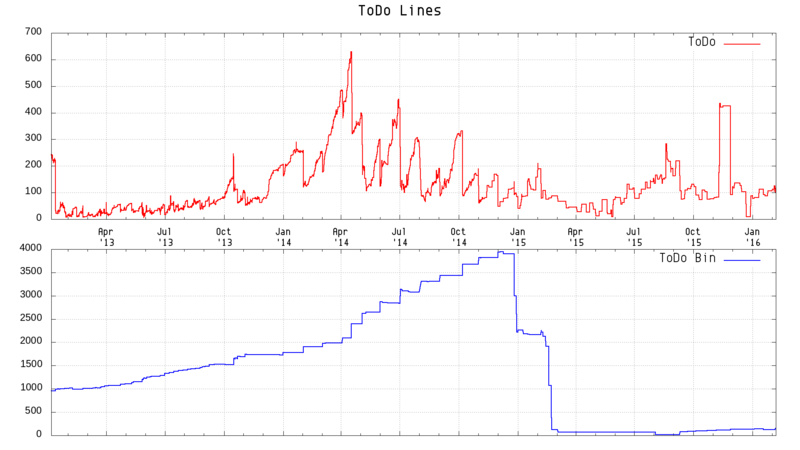 As the end of the first year, you can spot a fairly long flat line in ToDo Bin, thats when I only moved stuff from ToDo to ToDo Bin once a month, and you can clearly see the trend last for a year until the end of second year. During the first half of second year, I still constantly saved the ToDo, but since the September of the year, I reduced the saves. Normally, only when I had to leave X Window or reboot, then I would save. The last year, there is a significant drops in Bin, twice, one at the end of second year, another at around middle of February. 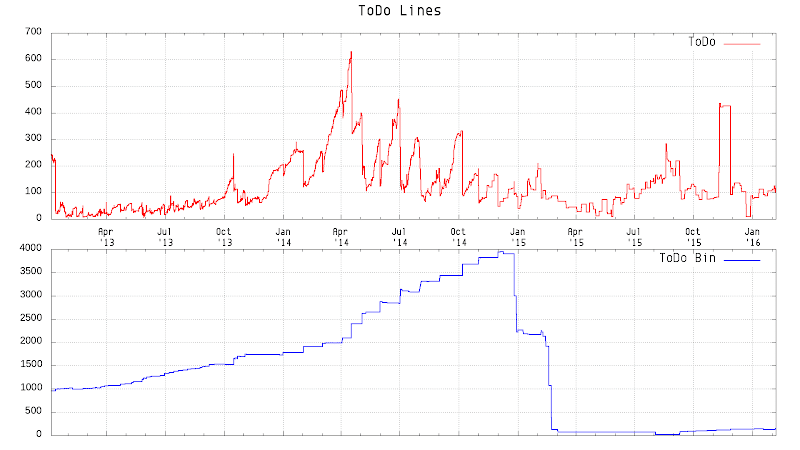 They were clean-ups, big ones, as you could see the lines of ToDo Bin almost reached 4,000 lines in the end of second year. I had to do something, or the Bin would be like a dump, although it was meant for that. There is one more thing I wanted to note, though unrelated to the lines, that is gnuplot is much easier to plot this type of graph, and the quality is great almost just out-of-the-box. I actually had updated the Python script for this and generated one before I got a chance to installed gnuplot of making a video, and I tried it out on the lines. This is the last entry and you do not want to read it from this point on.